When the idea of spending an extended period traveling began materializing, it did not include stops in any of the Scandinavian countries. Then, a crazy flight deal to Oslo on Norwegian Airlines appeared (around $300 each one-way) and we jumped on it. 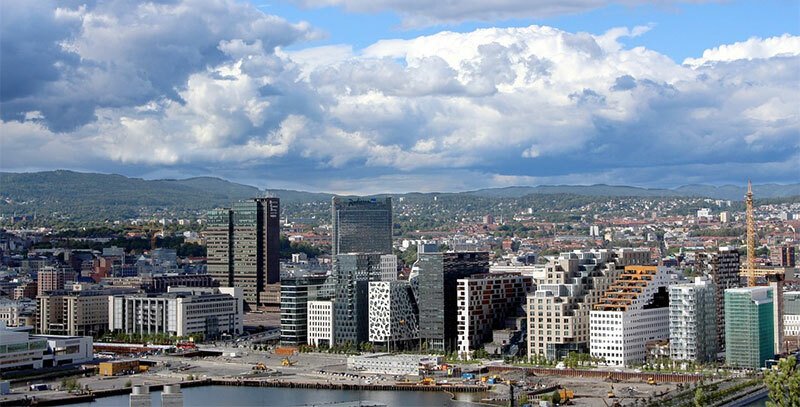 Number of things we knew about Oslo at the time – zero. Okay, that’s not exactly true – we knew that they have lots of daylight in the summer and that there are awesome looking fjords in Norway (later we learned those are about 5 hrs by train from Oslo). When you land at an airport in a major city, the last thing that you expect is for it to appear as if you are landing in the middle of a forest of pine trees. Yet, that’s pretty much exactly how it felt. Getting through immigration was a breeze, but navigating through the duty free area where you can buy cheap booze was more of a challenge. But, maybe the worst part of the arrival is that all of the decent restaurants at the Oslo airport are behind the security checkpoint where the terminals are located. So, when you arrive, you have no access to those. Instead, you get a pizza place, a Starbucks, a 7-11 convenience store, an outdoor bar-type place that serves food and another place that was selling really expensive pancakes. This is the point in the trip when we realized just how expensive eating would be while in Norway. Why did we eat at the airport? Because our flight landed at around 10am and we couldn’t check into our hotel until 3pm. Eventually though, we decided to split our waiting between the airport the Oslo Central train station. We were also secretly hoping for better food choices.